I can't even count how many times I've told myself never to interview another band. Friends have started telling me I'm biased when I praise bands. Ooh, I'm so sorry, you said you wanted Rivermaya? Suitcase101, a local band from Bohol is no fledging band with big dreams. It is composed of young, idealistic musicians. Last week, I saw them performed (singing the SK theme song) during the SK National Congress held at the Waterfront Hotel in Lahug Cebu City with Pres. Gloria Macapagal Arroyo as guest of honor (who said "Maganda!" referring to the band's performance) and more than 2,000 SK leaders from all over the country headed by SK national president Jane Censoria Cajes. Their story goes back three years ago when they decided to start a band. The name Suitcase101 was derived from the band Matchbox20, whom at that time the band started was quite popular. 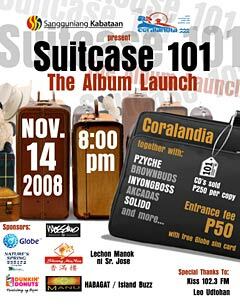 Formed in the mid-2005, Suitcase101 started as an acoustic band in a local resto bar in Bohol (we watched them performed at the then Martin's Bar with friends John Torralba, de Ers, Engr. Aprilmel Lupot, Julan Cordova, UBSSG etc for a drinking spree) with the band original members Alexis Balista, Rissa Cabalit and Sam Varquez who left the band for some reasons. Vocalist Adrian Bayron was in the band then. Its metamorphosis was closely watched by fans from being an acoustic band to alternative rock band. Suitcase101 continued performing and composing songs the new members decided to take the "band thing" seriously. With Adrian on vocals, Alva Duaban on guitars, Arvin Avergonzado on drums and Venjo Busalla on bass. Slowly gaining popularity with their first original composition "Kalahati" as their regular audience would bring over a friend the next time they come. There was even a time that the song was played twice on the same night as late comers would insist on requesting for the song even though it was already played earlier. They recorded the song "Kalahati" and two other original tracks namely "Never Need Someone" and "Three Years Since" in Backyard Project Studios in Cebu City last March 2007. They burst into Bohol's music scene as they released "Kalahati" and "Never Need Some" on local radio stations 911 FM and 102.3 Kiss FM, winning 6 Battle of the Bands, and opened for Manila-based artists such as Bamboo, Imago, Moonstar88, Hale and Urbandub to name a few. Suitcase101 created a wave when the band the national search of the GlobeKantabataan 2007. It seems that there was no depth on the band's name, but during the course of the Globe Kantabataan competition, the band was frequently traveling back and forth Manila and Bohol. They discovered that traveling together with the band makes their bond a lot stronger and they just love traveling together. Hence, the name Suitcase101 just fit quite right for the band. Slowly gaining recognition in the Visayas area as their songs "Kalahati" and Globe Kantabataan winning entry "Posible ang Lahat" are enjoying regular airplay in Cebu's radio stations 91.5 Hot FM and 93.1 Smash FM. The recent Battle of the Band that they won was Sandugo Battle of the Bands '07 where Adrian won the Best Vocalist, Alva as the Best Guitarist, and Arvin won as the Best Drummer for the third time. But the most prestigious competition they have won is the Globe Kantabataan '07. Besting over hundreds of hopefuls and making them 7-time Battle of the Bands Champions. Following the success of Globe Kantabataan, Alva decided to leave the band to pursue his nursing degree, a move that every parent should be proud of. Getting another guitarist was not a problem as Felix Bacareza was ready to fill the void that Alva left. Felix is not a stranger to the band as he had already played with the band as a session guitarist. The closeness of the members and support from their families and girlfriends�they gave the band the rush of energy�the energy they need to go to the studio, practice, produce an album and perform more gigs. The band thrives on playing live. Be it a small gathering or a big arena, they will sweat the same. Fueled by diverse influence on each of the members, their music combines an aggressive melodic vibe with honest to goodness lyrics, raw emotion and unrestrained passion. After three years, Suitcase101 has a self-titled debut album. They don't have regrets releasing a "late" album as the clich� goes, there's time for everything. The album has 11 songs: Riddle, Three Years Since, Kalahati, Never Need Someone (they hate girls! ), 163, Starlight, Foreman, Handuraw, Boholano, Live Loud Kicking Out and Lakas ng Himig, the official theme song of the Sangguniang Kabataan--- with two bonus tracks, Kalahati acoustic version and Posible Ang Lahat. Listening to the songs, Suitcase101 is creating a sound different from the rest, it's a Suitcase brand of music toning down the sound of maturity and turning up the volume of youthfulness. The songs in the album are edgies, funkier and really speak about their age and the fans. Adrian- Felix...He looks like Gerard Anderson according to my mom! Alva- I'm the cutest of them all! (Laughter). Felix- Hahaha it's me guys! Who has lots of girlfriends? Arvin: (Counting his fingers) 1 2 3 4 it's Adrian! Adrian: If underground movement si Venjo! Felix: Arvin!!!! The comments at the friendster speak so. Do you have indecent proposals from fans, especially girls and fags? Why you didn't accept previous offers? Arvin: There were offers before but we are Bohol based. Some managers want Manila based bands. Venjo: Dili pa daghan amung original songs. Adrian: I was teaching, now I devote my whole time to the band. The deadline of the submission of entries for the Ten Outstanding SK Chairmen of Bohol Search which organized by SK Bohol Federation headed by Jane Censoria Cajes is on Nov. 14. For details, you can visit SK office at the 2nd floor of the Capitol Building, or you may call 411-5914. Erstwhile Surigao del Sur representative Prospero Pichay, who's the National Chess Federation president, was the guest of honor and speaker during the 2008 Pres. 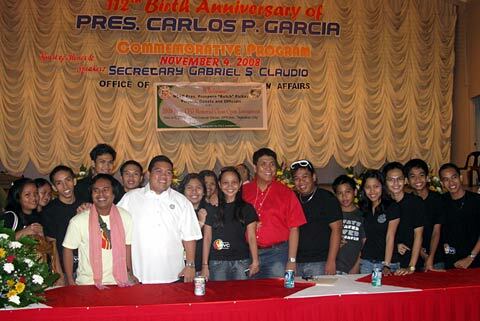 Carlos P. Garcia Memorial Open Chess Tournament on Nov. 4. The tourney was participated in by chess enthusiasts from the province. Bohol, according to Pichay, has produced Jedara Docena, a chess wizard from Antequera. Congratulations and goodluck to the participants and organizers of this year's City Division Press Conference. It was a d�j� vu seeing familiar faces during the presscon: Sir Melchor Daniel, Maam Natividad Bagaipo and Maam Fe Corazon Machete. your comments on "Bared... Suitcase101 launches debut album"